I'm going to try to be a little more diligent about participating with my fellow gluten free blogger friends who post their weekly menus. I think this is a huge help makes life much easier when I actually plan my menu. This week is hosted by Angela of Angela's Kitchen and the theme is "Get Your Grill On." Our menus these days are mostly paleo. I say mostly because we still eat rice and white potatoes. Oh yeah... and the occasional cookie made with sugar and hubs' penchant for homemade sweet tea...We might eat rice twice a month, potatoes about once a week. Some days I get a hankerin' for a Glutino chocolate cookie, but I limit it to two and that's that. But for the most part, we've become a paleo family. I like this because it makes meals really simple. Boring? Well, admittedly sometimes it is. But usually it's pretty awesome. When you go paleo you think about meals differently... suddenly zucchini, or broccoli, or even a mashed sweet potato become the base of your meal instead of pasta, rice (like I said, it's occasional, not all the time like it used to be! ), or bread. All proteins become fair game for breakfast... and fruit suddenly tastes amazingly sweet for dessert! The theme this week in the gluten free menu swap is grilling, but we don't grill. We don't have a fancy grill that starts up quickly... only an old charcoal grill that takes forever to heat up... so no grill recipes for us this week! 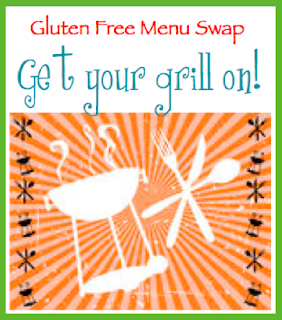 But make sure to check out the other awesome gluten free grillin' recipes at the Gluten Free Menu Swap! Sunday -- Organic all beef hotdogs from Nooherooka Natural with sauerkraut (no buns), hubs will have french fries, I'll have a baked sweet potato with mine. If I have time to make some chili, I might do that as well! Monday -- An oldie but goodie, Spinach Salad with warm Bacon Dressing, my friend Betty used to make this for dinner all the time when I lived with her after college. Wednesday -- I bought baby bok choy this week and needed a good recipe to make with it... found this "Braised Five-Spice Chicken with Vegetables" this looks like the perfect homemade alternative to take out! Yum! Thursday -- Breakfast for dinner!! Scrambled eggs, link sausage, and maybe a finely-diced cooked sweet potato or sauteed spinach. Friday -- On the road to visit family! Crossing my fingers this means we'll stop by Red Robin on the way to Western NC... they have some rockin' good gluten free burgers! Make sure to stop by Angela's kitchen to be included in the gluten free menu swap!! Hi Carrie! Nothing boring about your Paleo menu at all. :) I'd like to get our meals closer to a paleo diet, but can't quite commit to it yet. I should try it out on the family for a couple weeks and see how it goes. We probably have the same grill you have. It's a small Kettle charcoal grill, but we use it many times a week even in the rain and snow. If you buy a plug-in charcoal lighter like this one, and send the food out the door for your husband to grill, I think you will find that both of you will love to grill. First you (I mean your husband) will clean the grates. Then put a 12" diameter layer of charcoal in the bottom of the grill. Put the lighter on top. Cover with 2 or 3 layers of more charcoal. Use more charcoal for more food. Plug in the lighter. In about 15 minutes, or when the coals are white, unplug and spread out the coals with the lighter. You do need to use a gf charcoal. We use Kingsford. Marinades make an inexpensive cut of beef taste wonderful. I usually start the marinade when my husband is starting the grill. You can marinade longer, but I usually don't plan ahead far enough. If I do plan ahead and marinade earlier, Murphy's Law kicks in, a schedule change occurs and grilling doesn't work out for that meal. We prefer the taste of charcoal grilled foods over gas grilled foods. Love your blog. You have wonderful recipes and a wonderful heart. So... dinner at your place? :P Your menu is making me salivate! Will you be posting pictures? Hehe. Yum! Very nice menu. I'm a charcoal grill fanatic, too, like some of your other readers. Before we started using the Egg, my favorite method to light charcoal was the simple chimny with one sheet of newspaper in the bottom. Grilled food is a bit of a guilty pleasure with all that we hear about the risks. Still, gotta live dangerously from time to time.